The units [Casita Bayou & Casita Coco] are rented separately. If one unit is not available, please contact us for the availability of another comparable unit! Casita Bayou is the larger half of this uniquely configured private home called the CoCoBayou Cottage and it is the perfect escape for you and your guests. This side of the gorgeous home has recently been updated with new furnishings and completely renovated on the interior. A stunning new heated pool has been added, along with beautiful landscaping. This 2 bedroom / 1 bathroom has a spacious floor plan that accommodates up to 6 guests in two king beds in each of the bedrooms [sleeps 2 each] and a sofa sleeper [sleeps 2]. (4 Adults Maximum Please). Additionally, there is a fully equipped kitchen, washer/dryer, and a screened in lanai. If you want to stay connected there are 3 flat screen TVs, cable television, free Wi-Fi, and a telephone. 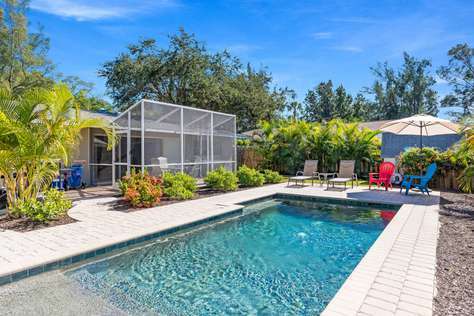 Enjoy the heated pool in the winter and a great backyard with plenty of space to sunbathe, grill out, or even hang by the canal and drop in a fishing line. Kayaks and bicycles are also available at the property as well! If you have a larger party [up to 10] and would like to book the entire cottage [Coconut Bayou Cottage], you will need to reserve both units together. If you have any questions, just contact our team for help! Honey Mango Cabana features a 2-bedroom, 1-bathroom configuration with a king size bed in the master and two twin size beds in the guest room. There is a sofa sleeper that sleeps 2 in the living room! Uniquely, this unit offers a large kitchen, offering granite countertops, stainless appliances, everything necessary to prepare and serve gourmet meals. Outside enjoy a shared pool with Honey Mango and private when both properties are reserved together. Should your vacation needs require more space contact our vacation specialist on how to reserve Mango Manor which includes Juicy Mango and Honey Mango. Welcome to Juicy Mango Cabana! This property is unique design as it is one half of a combined property called Mango Manor. Mango Manor is comprised of two separate cabanas that we call Honey Mango and Juicy Mango. 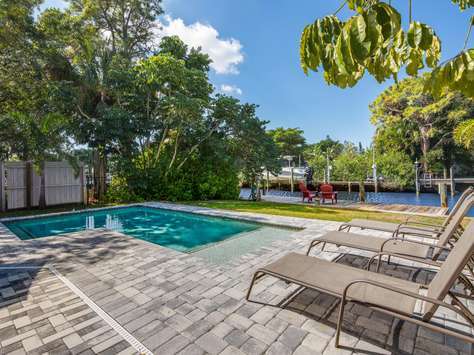 This home resides within Point of Rocks area, located just south of the Stickney Point Bridge, the most notable location on Siesta Key. Juicy Mango Cabana features a 2-bedroom, 2-bathroom configuration, with a king size bed in the master and a queen in the guest room. There is a sofa sleeper that sleeps 2 in the living room! Uniquely, this unit offers a large kitchen, offering granite countertops, stainless appliances, everything necessary to prepare and serve gourmet meals. Outside enjoy a shared pool with Honey Mango and private when both properties are reserved together. Welcome to Pelicans Perch! Newly renovated!! 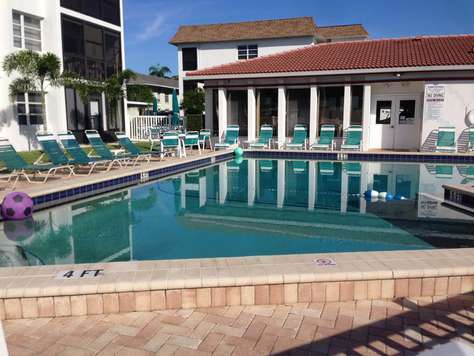 Located on the south end of Siesta Key near Point of Rocks Beach and Crescent Village. This spectacular condo is truly a sophisticated space. You'll enjoy granite counters, stainless steel appliances, refreshingly abundant natural light, brand new furniture, hardwood flooring throughout, and so much more! The Vista Hermosa community provides a pristine pool, outdoor shower, shuffle board, and one assigned parking space. You’ll be perfectly located in close proximity to convenience stores, restaurants, water sport rentals, and plenty of local shops that will have everything you could want to enjoy your stay. Pelican's Perch offers two cozy bedrooms with plush king size beds. The master suite boasts soothing decor, natural light, a private bathroom, and a walk-in closet. The second bedroom has equally tasteful decor and a walk-in closet. When additional sleeping space is necessary, the living room may host an additional guests via air mattress (please note: bedding is not provided for living room area). From the living room, you can open the sliding glass doors out to the screened in lanai to allow the beautiful Florida sun and cool ocean breeze to blow through. Come enjoy this tropical paradise while sitting upon Pelican's Perch and chase the sunset. Please note that your reservation must follow under the accordance of the Sarasota County code regulations. Welcome to Casita Blanca is one of two spaces with a combined name called Playa y Blanca. Casita Blanca is one of two special vacation homes that can be reserved separately or combined. The other available home is called Casita Playa and combined we call them Playa y Blanca. This single level (2 BR/1BA - Master BR/1 Queen & 2nd BR/2 twins -sleeps 4) vacation home features private, gated beach access, a sparkling clean hot tub in a private, lush setting, a communal heated swimming pool with plenty of pool furniture and a bathroom, as well as beautifully landscaped private front and back patio areas for entertaining and relaxing. The Florida Island vacation of your dreams begins HERE! Drive right up to the bougainvillea covered gate and unload your bags and your worries, don't waste a second of your precious vacation time waiting in line for elevators or parking garages. Stash the car keys... from this moment on, everything you need for an incredible beach vacation will be within walking and/or bicycling distance! After you've caught your breath on our spacious patio, take a short stroll down to our private, gated beach access point and behold the amazing wide expanse of the USA's #1 rated beach with the purest, whitest sand and clearest, azure gulf waters you will ever see. Check in with our beach attendant to enjoy the use of our PRIVATE BEACHFRONT lounge chairs and umbrellas (limited to 2 chairs & 1 umbrella during peak season but no worries, plenty of Tommy Bahama Backpack beach chairs, coolers, and a beach caddy are available at your home away from home!) The beach attendant can also provide you with rentals for ocean kayaks and paddle boards for an hourly fee. Just to the left of our beach access you'll find Point of Rocks, an area rich with coral formations and colorful marine life that is great for snorkeling and fishing. You've already stocked up at the close-by Crescent Market which offers a wide selection of groceries, produce, Boar’s Head deli meats, and fine wine & beer, so after a great day at the beach and/or the pool, throw some fresh fish on the grill (the only fish market on Siesta Key is also only a block away and prepare a nice dinner in our well equipped, stainless steel/granite kitchen. Too relaxed to cook? Rinse off in the outdoor shower and just head down the street to any number of casual or fine dining restaurant options. The Toasted Mango, Ophelia's, Turtle's, Anna's Deli just to name a few!) or maybe enjoy a margarita while listening to live music in the thatched hut Sneaky Tiki! Hop on one of the bicycles that comes with your vacation home or call a free golf cart-style taxi service (tips only) to explore anywhere else on the island you wish to go. This is paradise found, a single sunset from our gorgeous beach will have you hooked and keep you and your family returning to Siesta Key year after year. We look forward to sharing our island paradise with you! Contact our vacation specialists on how to reserve your space at the combined Playa y Blanca or separately as Casita Blanca or Casita Playa to suit your vacation needs. Welcome to Casita Playa is one of two spaces with a combined name called Playa y Blanca. Casita Playa is one of two special vacation homes that can be reserved separately or combined. The other available home is called Casita Blanca and combined we call them Playa y Blanca. This single level (2 BR/1BA - Master BR/1 Queen & 2nd BR/2 twins -sleeps 4) vacation home features private, gated beach access, a sparkling clean hot tub in a private, lush setting, a communal heated swimming pool with plenty of pool furniture and a bathroom, as well as beautifully landscaped private front and back patio areas for entertaining and relaxing. Welcome to Casita Mar of Sol y Mar. This single level (2 Bedroom / 1 Bathroom - Master BR/1 Queen & 2nd BR/2 twins -sleeps 4) vacation home features private, gated beach access, a sparkling clean hot tub in a private, lush setting, a communal heated swimming pool with plenty of pool furniture and a bathroom, as well as beautifully landscaped private front and back patio areas for entertaining and relaxing. These units [Casita Mar & Casita Sol] can be rented separately. When renting only one of the units, the hot tub is shared with the other unit. If one unit is not available, please contact us for the availability of the other! The Florida Island vacation of your dreams begins HERE! Drive right up to the bougainvillea covered gate and unload your bags and your worries, don't waste a second of your precious vacation time waiting in line for elevators or parking garages. Stash the car keys...from this moment on, everything you need for an incredible beach vacation will be within walking and/or bicycling distance! After you've caught your breath on our spacious patio, take a short stroll down to our private, gated beach access point and behold the amazing wide expanse of the USA's #1 rated beach with the purest, whitest sand and clearest, azure gulf waters you will ever see. Check in with our beach attendant to enjoy the use of our PRIVATE BEACHFRONT lounge chairs and umbrellas (limited to 2 chairs & 1 umbrella during peak season but no worries, plenty of Tommy Bahama Backpack beach chairs, coolers, and a beach caddy are available at your home away from home!) The beach attendant can also provide you with rentals for ocean kayaks and paddle boards for an hourly fee. Just to the left of our beach access you'll find Point of Rocks, an area rich with coral formations and colorful marine life that is great for snorkeling and fishing. You've already stocked up at the close-by Crescent Market which offers a wide selection of groceries, produce, Boar’s Head deli meats, and fine wine & beer, so after a great day at the beach and/or the pool, throw some fresh fish on the grill (the only fish market on Siesta Key is also only a block away) and prepare a nice dinner in our well equipped, stainless steel/granite kitchen. Too relaxed to cook? Rinse off in the outdoor shower and just head down the street to any number of casual or fine dining restaurant options (Captain Curt's, Clayton's, The Toasted Mango, Ophelia's, Turtle's, Anna's Deli just to name a few!) or maybe enjoy a margarita while listening to live music in the thatched hut Sneaky Tiki! Hop on one of the bicycles that comes with your vacation home or call a free golf cart-style taxi service (tips only) to explore anywhere else on the island you wish to go. This is paradise found, a single sunset from our gorgeous beach will have you hooked and keep you and your family returning to Siesta Key year after year. We look forward to sharing our island paradise with you! The South Village offers a convenient grocery store with a great butcher shop and wine selection, boat and kayak rentals, ice cream shops, outdoor casual dining and entertainment venues and truly some of the finest restaurants on Siesta Key – Mattison’s Grille, Capt. Curt’s, the Sneaky Tiki, Javier’s, Miguel’s, Anna’s Deli. Turtle’s, Ophelia’s and many others all nearby. And if you choose to go anywhere else on the Island, a system of free taxi’s [extended surrey top golf carts – tips only] are available on your request. Welcome to Casita Sol of Sol y Mar. This COMPLETELY RENOVATED, single level (2 Bedroom / 1 Bathroom - Master BR/1 Queen & 2nd BR/2 twins -sleeps 4) vacation home features private, gated beach access, a sparkling clean shared hot tub in a private, lush setting, a communal heated swimming pool with plenty of pool furniture and a bathroom, as well as beautifully landscaped private front and back patio areas for entertaining and relaxing. The South Village offers a convenient grocery store with a great butcher shop and wine selection, boat and kayak rentals, ice cream shops, outdoor casual dining and entertainment venues and truly some of the finest restaurants on Siesta Key – Mattison’s Grille, Capt. Curt’s, the Sneaky Tiki, Miguel’s, Anna’s Deli. Turtle’s, Ophelia’s and many others all nearby. And if you choose to go anywhere else on the Island, a system of free taxi’s [extended surry top golf carts – tips only] are available on your request. 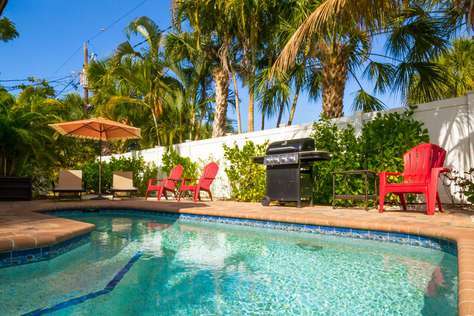 Sophie’s Cottage is a smart, sophisticated upscale waterfront retreat with a private heated pool with sun-shelf, boat dock and a one and a half block walk to Siesta Key Beach. Ideally, it accommodates 6, but can easily sleep up to 8 with 2 private bedrooms, and 2 bathrooms and 2 sleeping areas in the living room and sunroom. This lovely cottage is accessed through a lavishly landscaped courtyard bordered by a bright white scalloped picket fence. As you enter this spotless home, you immediately enjoy the soft subtle colors and cool sophistication resounding throughout the home. The front screened porch with rockers and wicker chairs invites you to sit a moment and enjoy Sophie’s hidden Garden with flowers of various colors. Very intriguing…. Just inside glossy white trim abounds throughout with walls painted in subtle, soothing shades of grey and mauve, floors finished in white tile or ash wood. You’ll find bright, clean spotless bathrooms finished in white tile, while a well lit kitchen filled with stainless steel appliances beckons you to prepare gourmet foods for your family and friends. A granite top dining table seats 6 with a lovely water view while 4 more can sit at the kitchen counter on stylish bar stools. Sophie’s Cottage sleeps up to 8 with a king bed in the master [sleeps 2], a queen bed in the 2nd master [sleeps 2], an Ikea convertible queen sofa bed in the living room [sleeps 2] and finally a convertible queen futon bed in the 3rd room [sleeps 2]. Flat panel televisions abound everywhere, but a huge outside sun deck will quickly compel you to slip outside into the Florida sunshine and warmth. A beautiful expansive deck of rustic soft gray pavers surrounding a private heated pool with sun shelf will welcome you to the warm sunny outdoors. Here you can slow down just a moment and enjoy the surrounding tropical Florida fauna and palm trees. The cottage is colored in a soft sea-washed gray with white shutters and trim, just as you might envision a waterside cottage at the beach in your dreams. You also have the opportunity to explore the canal system with two (2) kayaks available to you or explore the island with four (4) bikes available for your use as well. At night the waters light up at the enormous fishing dock on the canal where you and your family will be challenged with an abundance of large fish which include snook, red fish and snapper that love to gather around the snook light each evening. Everyone will truly be in-captivated by both the fish and light. Yes, you can fish right off the dock too! PLEASE NOTE: There is a 14 night minimum stay or 1 rental per 30 day period, per SRQ ordinance. 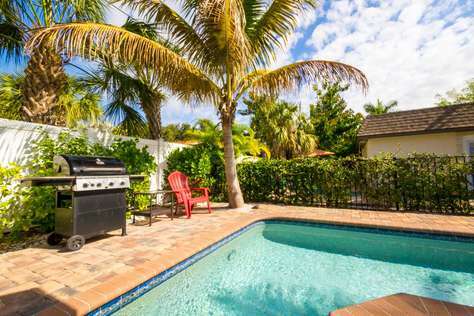 Siesta Key Village is approximately 1 mile north of Avenida Del Mare. A leisure walk will get you there in 15 minutes. Plenty of restaurants, shops and night spots. Florida is known for its beaches, climate and foliage so this home features on its grounds an amazing amount of lavish tropical foliage to include many flower species as well as many fruit tree varieties. If you like plants and nature, you’ll love the grounds [almost like a botanical garden]. The Nation’s Number One Beach is only a short walk from the cottage and so compelling. 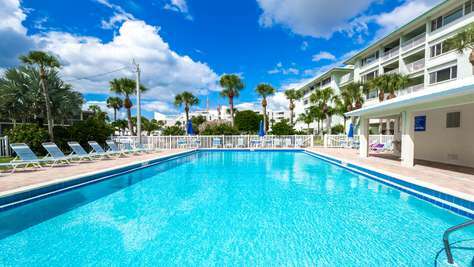 Welcome to The Seagull, a 2BD/2BA private condo perfectly located only 1/2 mile from Siesta Beach and located in the heart of Siesta Key Village. This spaciously designed open floorplan comfortably sleeps 8! Meticulously updated with nothing but tender loving care, The Seagull is a beautifully designed private retreat that features a shared heated pool with 9 other units in a very selective, private community in one of the best locations on the entire island. There is nothing but your comfort in mind. The Seagull is equipped with all the amenities that makes Siesta Key so fun: beach caddies, chairs and towels and more. The grounds are professionally landscaped giving it a lush and inviting Florida feel! This second floor unit (stairs are required to access it) is closest to the pool area for easy access and inside the condo is lovingly decorated and designed to accommodate 8 people with space and relaxation always in mind. The master bedroom features a king size bed (sleeps 2) and a private bathroom. An oversized guest room features a queen size bed and a set of bunks for the kids (sleeps 4)! In the living room, the sofa can turn into a queen size sleeper (sleeps 2) designing the space to accommodate 8 guests, whether they be friends or family alike! The shared guest bathroom is entered by the hallway. The Seagull boasts plush linens and towels and an attention to detail that makes the little things so significant! Stainless steel appliances, granite counters, and beautiful hardwood cabinets make this kitchen quaint but powerfully well stocked and easy to use. Cooking dinner for 8 is a breeze and serving in the dining area with enough to seat 8 around a table with comfortable chairs and benches makes for great times with good food, great company and excellent game nights! If it's time to explore Siesta Key, just meander downstairs for a night on the town! You're located in the heart of Siesta Key... head in either direction and you will find restaurants, bars, and shopping less than a block away. The north end of Siesta beach is less than a 10 minute walk, where you will truly experience the best views of the sunset and some of the most clear and Caribbean style waters this gulf has to offer. Just south of what we call "Sunset Point" is the main beach access where you can enjoy the lifeguard stands, beach park, concession stands and restaurant along with the famous Siesta Key Drum Circle that only happens every Sundays at dusk! If you wish to roam farther, we would recommend taking the bicycles or hopping on the free trolley... there is much to see and do on Siesta, including the South Village, Crescent Beach, Turtle Beach, the bay and the marina... all of Siesta can be explored in less than a 10 minute drive, 30 minute bicycle ride, and if you're so inclined, you can walk the entire beachside in an hour! Great way to exercise but another great way to learn all the nuances that makes our island so special. We hope you enjoy the Seagull and that it becomes your forever vacation home! Welcome to Siesta Key! Sea Wave Casita, which can be combined with Sea Shell Casita to create Villa Brisa Marina, features its own brand new, semi-private heated pool, (shared with other unit when booked separately) a “sun shelf” and a three minute walk to the Nation’s finest beach [no major streets to cross]. These units [Sea Wave and Sea Shell] can be rented separately. The décor is beautiful and reminiscent of the seashore with Sea Shells and Sea Waves [found only in the Point of Rocks area] themes. It’s clearly “beachy” but luxurious here. As you might expect Sea Wave casita is truly a decorator’s dream offering beautiful wood floors enhanced with tropical wall colors and white trim. Sleeping accommodations for 6 are provided with a master bedroom which includes a king size bed (sleeps 2) and a private bath. Second bedroom with a total of two twins (sleeps 2) and a separate living room with a queen size sofa sleeper (sleeps 2) share an additional bathroom. Leather couches, beautiful new décor and flat panel, wall-mounted TV’s abound everywhere [all bedrooms and living areas] make visiting Sea Wave Casita such a joy for your family and friends. Fine linens, towels and everything else are truly “first class” here. Everything you need for a wonderful experience is here. Outside you’ll find 2 bicycles and beach equipment and private parking for up to two vehicles. Outside a private porch and seating are available for those quiet moments you sometimes need: a cup of coffee in the morning, a cocktail or a glass of wine in the evening. Washers and dryers are also available in the home. As you sit by the pool in the warm sun relaxing, you’ll struggle with the decision to go down to the Nation’s number 1 beach or perhaps to the south village area, all within easy walking or biking distance of Sea Wave Casita. The lush, tropical landscaping up-lighted for special effects at night immediately reminds you of your attraction to Siesta Key Beach, our tropical paradise. Sea Wave Casita is a truly unique vacation home that you, your family and friends will truly enjoy, and sure to be your choice returning year after year. 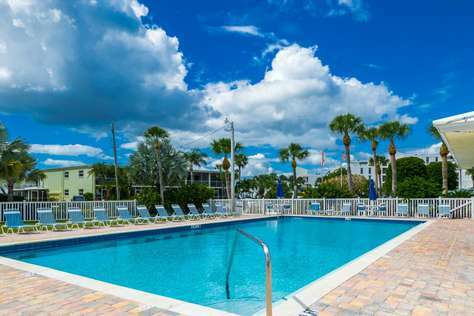 The South Village offers a convenient grocery store with a great butcher shop, boat and kayak rentals, ice cream shops, outdoor casual dining and entertainment venues and truly some of the finest restaurants on Siesta Key. And if you choose to go anywhere else on the Island, a system of free taxi’s [extended surrey top golf carts – tips only] are available on your request. Sea Shell Casita, which can be combined with Sea Wave Casita to create Villa Brisa Marina, features its own brand new, semi-private heated pool, (shared with other unit when booked separately) a “sun shelf” and a three minute walk to the Nation’s finest beach [no major streets to cross]. As you might expect Sea Shell casita is truly a decorator’s dream offering beautiful wood floors enhanced with tropical wall colors and white trim. Sleeping accommodations for 6 are provided with a master bedroom which includes a king size bed (sleeps 2) and a private bath. Second bedroom with a total of two twins (sleeps 2) and a separate living room with a queen size sofa sleeper (sleeps 2) share an additional bathroom. Leather couches, beautiful new décor and flat panel, wall-mounted TV’s abound everywhere [all bedrooms and living areas] make visiting Sea Shell Casita such a joy for your family and friends. Fine linens, towels and everything else are truly “first class” here. Everything you need for a wonderful experience is here. Outside you’ll find bicycles and beach equipment and private parking for up to two vehicles. Outside a private porch and seating are available for those quiet moments you sometimes need: a cup of coffee in the morning, a cocktail or a glass of wine in the evening. Washers and dryers are also available in the home. As you sit by the pool in the warm sun relaxing, you’ll struggle with the decision to go down to the Nation’s number 1 beach or perhaps to the south village area, all within easy walking or biking distance of Sea Shell Casita. The lush, tropical landscaping up-lighted for special effects at night immediately reminds you of your attraction to Siesta Key Beach, our tropical paradise. Sea Shell Casita is a truly unique vacation home that you, your family and friends will truly enjoy, and sure to be your choice returning year after year. Coral Reef Casita, which can be combined with Star Fish Casita to create Villa Dom Brisa, features its own brand new, semi-private heated pool, (shared with other unit when booked separately) a “sun shelf” and a three minute walk to the Nation’s finest beach [no major streets to cross]. These units [Coral Reef & Star Fish] can be rented separately. The décor is beautiful and reminiscent of the seashore with starfish and coral reef [found only in the Point of Rocks area] themes. It’s clearly “beachy” but luxurious here. As you might expect Coral Reef casita is truly a decorator’s dream offering beautiful wood floors enhanced with tropical wall colors and white trim. Sleeping accommodations for 6 are provided with a master bedroom which includes a king size bed (sleeps 2) and a private bath. Second bedroom with a total of two twins (sleeps 2) and a separate living room with a queen size sofa sleeper (sleeps 2) share an additional bathroom. Leather couches, beautiful new décor and flat panel, wall-mounted TV’s abound everywhere [all bedrooms and living areas] make visiting Coral Reef Casita such a joy for your family and friends. Fine linens, towels and everything else are truly “first class” here. Everything you need for a wonderful experience is here. Outside you’ll find bicycles and beach equipment and private parking for up to two vehicles. Outside a private porch and seating are available for those quiet moments you sometimes need: a cup of coffee in the morning, a cocktail or a glass of wine in the evening. Washers and dryers are also available in the home. 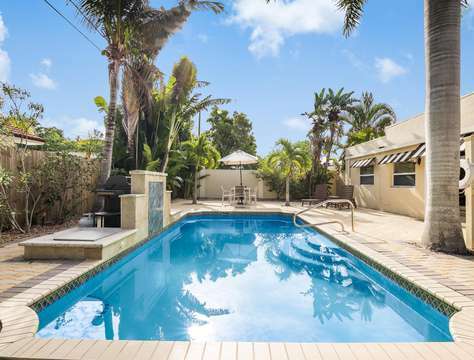 As you sit by the pool in the warm sun relaxing, you’ll struggle with the decision to go down to the Nation’s number 1 beach or perhaps to the south village area, all within easy walking or biking distance of Coral Reef Casita. The lush, tropical landscaping up-lighted for special effects at night immediately reminds you of your attraction to Siesta Key Beach, our tropical paradise. Coral Reef Casita is a truly unique vacation home that you, your family and friends will truly enjoy, and sure to be your choice returning year after year. As you may already know, Siesta Key’s beach offers some of the finest, purest white quartz sand found anywhere in the world. 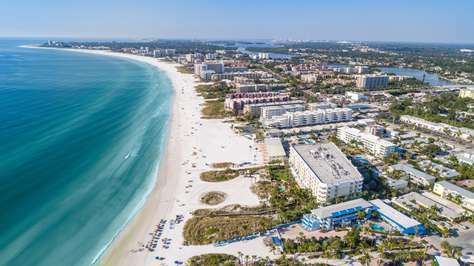 Rated number one in the nation, you’ll soon discover why you’ll always want to return to Siesta’s fabulous shoreline. The South Village offers a convenient grocery store with a great butcher shop, boat and kayak rentals, ice cream shops, outdoor casual dining and entertainment venues and truly some of the finest restaurants on Siesta Key. And if you choose to go anywhere else on the Island, a system of free taxi’s [extended surrey top golf carts – tips only] are available on your request. Star Fish Casita, which can be combined with Coral Reef Casita to create Villa Dom Brisa, features its own brand new, semi-private heated pool, (shared with other unit when booked separately) a “sun shelf” and a three minute walk to the Nation’s finest beach [no major streets to cross]. As you might expect Star Fish casita is truly a decorator’s dream offering beautiful wood floors enhanced with tropical wall colors and white trim. Sleeping accommodations for 6 are provided with a master bedroom which includes a king size bed (sleeps 2) and a private bath. Second bedroom with a total of two twins (sleeps 2) and a separate living room with a queen size sofa sleeper (sleeps 2) share an additional bathroom. Leather couches, beautiful new décor and flat panel, wall-mounted TV’s abound everywhere [all bedrooms and living areas] make visiting Star Fish Casita such a joy for your family and friends. Fine linens, towels and everything else are truly “first class” here. Everything you need for a wonderful experience is here. Outside you’ll find bicycles and beach equipment and private parking for up to two vehicles. Outside a private porch and seating are available for those quiet moments you sometimes need: a cup of coffee in the morning, a cocktail, or a glass of wine in the evening. Washers and dryers are also available in the home. As you sit by the pool in the warm sun relaxing, you’ll struggle with the decision to go down to the Nation’s number 1 beach or perhaps to the south village area, all within easy walking or biking distance of Star Fish Casita. The lush, tropical landscaping up-lighted for special effects at night immediately reminds you of your attraction to Siesta Key Beach, our tropical paradise. Star Fish Casita is a truly unique vacation home that you, your family and friends will truly enjoy, and sure to be your choice returning year after year. The Orchid and Hibiscus Villas are two separate units which can be uniquely configured to create Villa Cascada, an absolutely beautiful and stunning private pool home. These units [Orchid & Hibiscus] can be rented separately. When rented separately, each unit features two bedrooms and a sleeping den that sleeps up to 6, with 2 full bathrooms, a gourmet kitchen, living room-dining area and an almost unbelievable pool courtyard. These units are well located just two quick blocks and easy walking distance to Beach Access 13, the famous “Point of Rocks” beach area. As you enter the privately gated courtyard to the Orchid or Hibiscus Villa at “Villa Cascada,” you quickly notice the brown striped sunbrella awnings shading the soft banana yellow home and begin to sense the beauty of the tropics and special allure of this property. Especially designed for families and friends vacationing together, The Orchid or Hibiscus Villa sleeps as many as 6 in two bedrooms each having a King or Queen bed along with a separate full daybed [sleeps 2]nestled in an open, but separated, arched Den off the Queen size bedroom. All bedrooms and living areas have wall mounted flat panel televisions and plenty of closet space with custom built-in shelving. All bathrooms are spotless, bright, clean, and full tile with glass shower enclosures or glass block walk-in showers easily accessed by all rooms. Outside full showers accommodate everyone coming in from the beach. The entire home is floored with rich, luscious travertine throughout. The neutral colors yet vibrant artwork immediately restore your faith in the soothing power of tropical surroundings. Unique to most 2 bedroom units, these villas offers large kitchens with granite countertops, brand new stainless appliances, and everything necessary to prepare and serve lavish gourmet meals for a huge group, even a wine cooler as well. The exquisitely furnished, expansive living area with leather couches offers the opportunity for all to gather in a single room to watch their favorite programs on wall-mounted HDTVs. There is plenty of dining seating at the table, bar counters or poolside to accommodate everyone and the moment’s desire. And if an absolutely plush interior is not enough, outside you will find an enormous pool featuring a large waterfall and side sprayers to add to the mystical tropical sounds that lull you quickly into a tranquil relaxed state. This pool courtyard becomes a magical spectacle at night with beautiful up lit landscape lighting all around. Perhaps another family or your traveling group of friends will join you to share the heated pool & outside deck area. The large private, pool courtyard is filled with outdoor furnishings to complement your full enjoyment of this tropical paradise. Only two families staying at the Orchid Villa or the Hibiscus Villa may share the large deck areas and pool facilities at Villa Cascada so privacy is always assured. The pool courtyard is surrounded by lush tropical vegetation for shade and enjoyment, and a 6′ high privacy wall, all designed to enhance that special tropical feel. Within walking distance [most less than ¼ of a mile] you’ll find all of the great shops, markets, bars and restaurants located in the South Village-Crescent Beach area. The Hibiscus and Orchid Villas are two separate units which can be uniquely configured to create Villa Cascada, an absolutely beautiful and stunning private pool home. These units [Hibiscus & Orchid] may be rented separately. As you enter the privately gated courtyard to the Hibiscus or Orchid Villa at “Villa Cascada,” you quickly notice the brown striped sunbrella awnings shading the soft banana yellow home and begin to sense the beauty of the tropics and special allure of this property. Especially designed for families and friends vacationing together, The Hibiscus or Orchid Villa sleeps as many as 6 in two bedrooms each having a Queen bed along with a separate full daybed [sleeps 2]nestled in an open, but separated, arched Den off one of the Queen size bedrooms. The large private, pool courtyard is filled with outdoor furnishings to complement your full enjoyment of this tropical paradise. Only two families staying at the Hibiscus Villa or the Orchid Villa may share the large deck areas and pool facilities at Villa Cascada so privacy is always assured. The pool courtyard is surrounded by lush tropical vegetation for shade and enjoyment, and a 6′ high privacy wall, all designed to enhance that special tropical feel. Within walking distance [most less than ¼ of a mile] you’ll find all of the great shops, markets, bars and restaurants located in the South Village-Crescent Beach area. Nearby you’ll find the Crescent Beach Grocery, a gourmet market that features one of the best butcher shops in Sarasota as well as an amazing wine selection. “Big Water Fish Market” located in the Crescent Beach shopping plaza at 6641 Midnight Pass Road is the only fish market available on Siesta Key. “CBs Bait and Tackle Shop” at Stickney Point Bridge offers both fishing tackle, fishing guides and boat rentals. Restaurants in the immediate area include some of the best on Siesta Key: Javier’s, Miguel’s, Capt Curt’s, Turtle’s on Little Sarasota Bay, Ophelia’s on the Bay, Clayton’s Siesta Grill, Crescent Club, City Pizza and Anna’s Deli II just to mention a few. Davidson’s Drug, the US Post office and numerous souvenir shops, giftware shops, and eateries await your adventuresome spirit. Siesta Key Public beach is about 2 miles north on Midnight Pass Rd and provides parking capability for 800 cars along with restrooms, etc.And you can walk to it right on the beach as well. Siesta Key’s North Village is 2.8 miles north and is always a lot of fun with many restaurants, shops, and attractions. The city of Sarasota is filled with restaurants, art galleries, museums, shopping opportunities, theaters, etc., and offers much to do and see.